KS1 and KS2 | Objective: To explore the real-life story of a refugee family and their cat using storytelling, discussion and drama activities. Sura and her family fled Iraq and became refugees in Europe. They took their cat with them, but he was lost on the journey. Following intervention from aid-workers and communities across the world, the family and their pet were reunited. 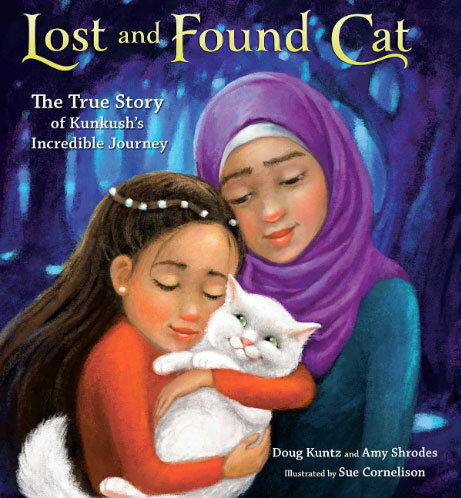 This download explores the challenges faced by the family and other refugees through the heart-warming story of Kunkush, the refugee cat. This two-minute video by The Guardian (displayed below) shows Kunkush being reunited with his family. It is appropriate for children (but please watch first to check for suitability). It should not be shown to students until the end of the drama activities. This complete lesson plan includes such activities as storytelling, freeze frames, thought tracking, teacher in role, action clip and improvisation. All the activities are fully explained. There are also opportunities for writing, discussion and visual art follow-up. Click the button to download the full 9-page Refugee Cat Drama Unit (PDF) for just £4.97 with PayPal.